To be a good wildlife photographer, you need to have a lot of patience. Patience for the animal to move into the position you want, or for the sun to get lower in the sky, or for the elusive creature to finally show itself. To be the wife of a wildlife photographer, you need to have a lot more patience than that. Patience for the photographer to come home! Wildlife typically avoids humans. Therefore, wildlife and wildlife photographers are usually found in remote locations far from civilization. Spouses of wildlife photographers are often found alone at home! I am currently home alone in Katete. Will is with the animals of South Luangwa. Living in Zambia means that the distance between home and the wildlife is much smaller than it was when we lived in London. This has positives (Will goes on shorter duration trips) and negatives (he goes more frequently). Being a doctor keeps me pretty busy though, making his absences easier. I’ve never minded my own company, but a big help here is that I live on hospital site with plenty of friends close by. Doctors and medical students eat dinner together in the mess every night, and hang out for a bit afterwards. So there is little time to feel lonely. During the time that I am at home on my own, I find myself with plenty to do. However, one of the things I am proudest of is that Zambia seems to be bringing out a domestic goddess in me that I didn’t know existed. My Mother is a proper domestic goddess who knows how to do all sorts of nifty things with a sewing needle, and can fashion a pudding from virtually no ingredients. Although she has always been proud of my achievements in my career as a doctor, I think she has always despaired at my lack of domestic aptitude. Despair no more! 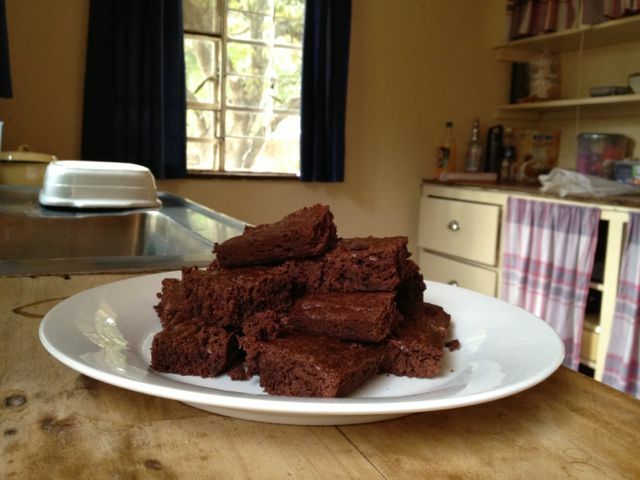 Last weekend, after a morning hiking in the Mpangwe Hills, I suddenly felt inspired to bake, and before I knew it, I had a yummy batch of brownies that were devoured at sundowners. I’ve also embraced the world of invisible mending. With a limited number of clothes here, when I ripped the back pocket of my trousers causing a revealing hole, I had no choice but to mend it, and the repair job was surprisingly sound. The final bit of evidence that I am slowly turning into a domestic goddess worthy of my Mother’s approval, is that I am now ironing everything, including underwear. I can’t take full credit for this sudden ironing transformation though. I have been informed that there are Putzi flies in Zambia. The flies like to lay eggs in damp clothes drying outside. The larvae can penetrate your skin, causing a boil that a maggot will eventually emerge from! Ironing thankfully kills the eggs/larvae, making ironing suddenly seem quite essential. Those brownies look SO good! Will will be delighted by your new-found domestic skills, and your mother will be so proud of you. Ironing underwear … wow. But better than those creepy critters invading you. Sounds like you have found all kinds of ways to endure Will’s absences. I’m sure he misses you, too, when he’s out in the bush without you. But then he brings back amazing photos that the two of you can enjoy while eating brownies in your freshly pressed undies. Perhaps one solution to Will’s frequent absences to to let him in on the fresh baked brownies?